There is a new Beta version of Skype for Windows Mobile Here. The beta released today is listed as version 3.0.0.100 with new items of being able to send files and SMS. It's still Compatible with WM Pro and Standard, 5, 6 and 6.1. 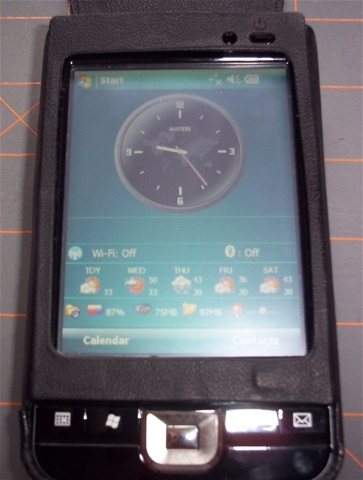 This includes Pocket PC, Classic or Professional; Smartphone and standard devices according to their specs. Please refer to the link for further information on it. Here is something else for anyone interested. Stuffback is having an anniversary sale for Enhanced Service Customers, but it ends 03/29, according to the courtesy email I received. 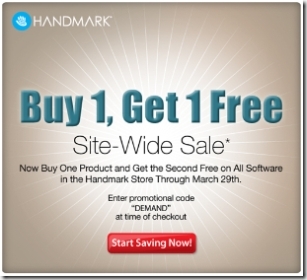 > 50% off label, tag and pack purchases if ordered by March 29, 2009." If you are new to Stuffback check them out Here and see if there are solutions for you. 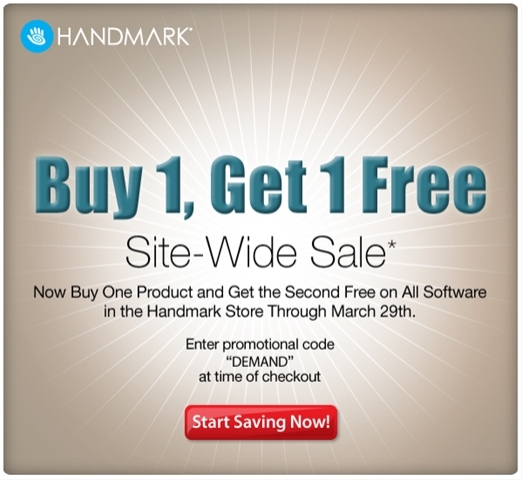 This sale information was in my mailbox last night and I wanted to give you an FYI in case you were not aware of this Buy 1, Get 1 Sale, and wanted some of their software. 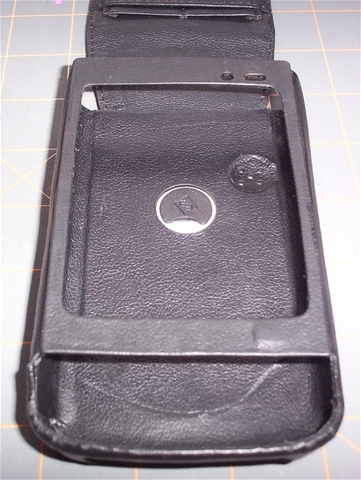 I have been in the market for a new leather case for my Ipaq 210. I have a metal case I use but I wanted a flip up cover leather style for use at home and local travel. I researched the web for the various cases available. I then stumbled upon this case from EB Cases. I was actually watching an iPhone EB Case review someone did on YouTube that prompted me to visit EBCases.com. 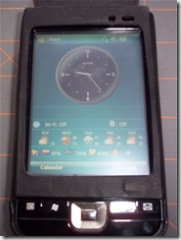 I also used to have an EB case in the days of the HP Jornada 540 series Pocket PC, but moved on to other brands since then. Quite frankly, I totally forgot about EB cases since then. 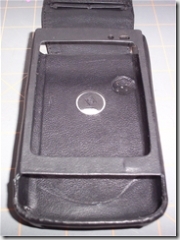 I posted on some forums looking for user opinions and searched for any reviews already done on this case that they call the eNOVO Duo iPAQ 210 Series. I could not find any reviews. I looked at the pictures of this case on their site and compared it to other brands and made the decision to purchase the black case. 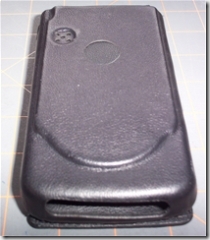 So while their case brand is not really new news, I figured this review may help others looking for a case for their iPaq 210. So, for all the ipaq 200 series old School PDA’ers like me, this is for you. The case itself seems really durable and sturdy. It seems like sides are like hard leather with very little flex. Very nice. I unpacked the box and was checking out the metal post. The backing on the post is screwed on so you need to unscrew it with the included tool and install it in the case if you want to use it. I tried it and removed it because I do not use the belt clip options. I will say though that this seems like a great metal post system though compared to other brands. If you head over to this Link and click on the “Removable Belt System” Demo, you can see what I mean more clearly than me telling you about it. The clip is a plastic clip. I do not think there is anything special to this, just a different design. If you do not use the belt clip, you get a leather plug that goes in its place. You secure it from the other side with a little plastic piece. It took me a little while to get it the way I wanted it and clipped into place. I then slipped my ipaq into the case. It is a very snug fit. It took a minute for me to get the ipaq back out again. On the front of the cover, you have the little metal "EB" logo on the lower right side. 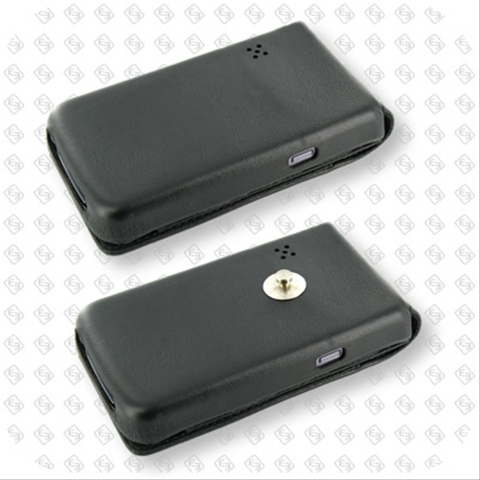 On the reverse of the flip cover, there 2 slots for SD cards and threes spaces for credit cards, business cards, license, etc. 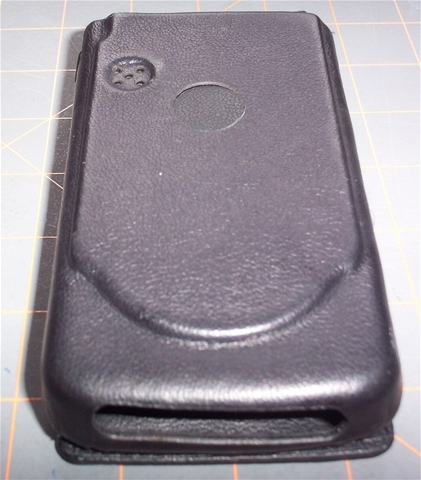 The cover is not removable and closes to the bottom of the case via two magnets that are in the leather above the hard keys of the iPaq. Looking at the iPaq in the case, there are cutouts for the light sensor and the Wi-Fi / BT lights. There is no cutout where the HP logo is, as you may find on other brand cases. There is also a power icon above where the power button is on the iPaq. There is no cutout for the power button itself but if you press the logo area, this turns the device on (and sometimes it does not). On the sides, there are cutouts for the stylus, reset button and record button. On the bottom, there is a cutout for the sync, mini USB and earphone connections. 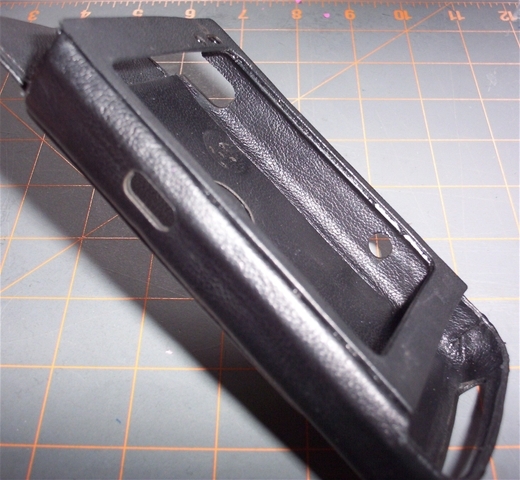 There is no cut out for the lanyard connector on the lower side (if anyone uses that) like you may find on other cases. Looking at the back of the case, this is where they made a recent change. At the time of this review and when I made the purchase, this is what the back of the case was supposed to look like, flat. They redesigned (which caused a delay in shipping that I will talk about it later) the case. Instead of being flat, it has a built out type style. I am not sure why. This does not accommodate any extra size batteries. I kind of like it though. 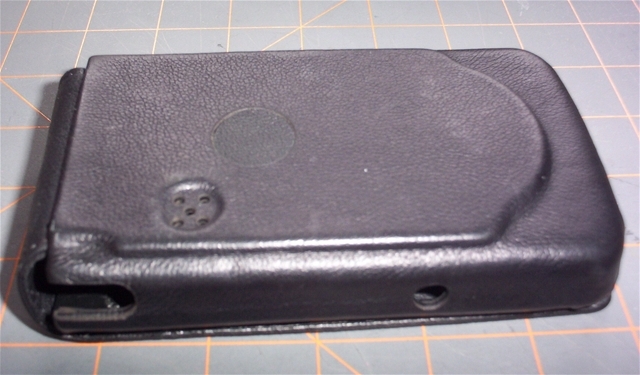 Also on the back, is a cutout for the rear speaker of the iPaq, as well as the previously mentioned hole for the metal post. I have only had it for a day but my initial thoughts are that I like it for my use. It seems like a quality product. My opinion on the cover though is that if you frequently throw your iPaq into a bag or backpack, that the leather flip cover may not adequately protect your screen like a hard case does. The magnets do hold the cover in place, but I can see other objects that could bump it off and allow something to go under it and scratch the screen. I think a lot of people in general no matter what type of leather case it is, have this feeling and similar worry. I agree but my intent is to continue using my metal hard case for trips when I throw my unit into a bag. Will this protect your iPaq in the event of a fall? I am sure it will offer some level of protection depending on what type of fall and impact it makes. Honestly though, I am not going to drop my iPaq and test that scenario out for you. The case feels good in my hand and is very comfortable. It does add more bulk than my metal case does so I am not sure yet regarding pocket-ability. While I like the case a lot so far, I was not impressed at all with the level of customer service. I received the case in the mail yesterday, 03/22/09. I ordered it two months ago, on 01/21/09. I ordered the black case because their website said it was in stock. I called them a few days later to see when it would be shipped because I would have imagined it would have shipped by then. The rep stated that they did not have any in stock and were hoping to have them in a week or so. As I was talking to the rep, the website still said in stock for the black cases which I informed him. On 01/28, I got a generic email that said: “We expect to have these cases ready for shipment next week. We do apologize for the delay. Please let us know if you have any additional questions.” I gave it a couple weeks and replied to the email address requesting a status update. Their email did say to let them know if I had any questions. No one had the courtesy to contact me back, either by email or phone. My wife called them after that at which point they said the case was being redesigned and they were waiting for them to arrive. Now, I had paid via PayPal so they already had charged me and had my money. My wife said I should have canceled the order but I wanted to see what the case was like. On 03/10, I got an email from EB Cases saying my order shipped, but there was no shipping tracking number. The case was actually shipped on 03/16, almost a week later, as confirmed by the FedEx tracking number and email. I understand things happen but that is the purpose of good communication, to keep your customers in the loop and happy. So, while yes I do like the case, it will not surprise you when I say that I will never order anything from EB Cases again. I am not going to write and say you should not either, as you can make your own decision on where to spend your own hard earned money. In this current economy, I will put my money in support of business that not only provides great products, but great customer service. That makes a great value in my opinion and I am not seeing the total package here. -Only one leather & plastic plug. I would imagine that this is one of the things that could get lost or damaged. It would have been nice to have an extra one included. 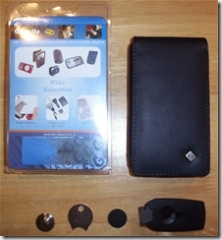 The case is priced at $49.95 USD directly through EB Cases. 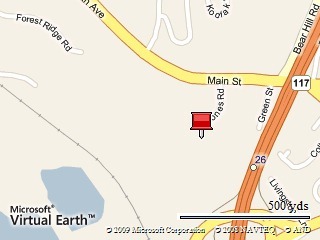 You may also be able to find it through a reseller of theirs. I would say this is priced between mid to upper cost, when comparing it to the other cases on the market. The site says they have a red case available but you need to allow up to 15 days. It says new release but it also said this on 01/21 as well. 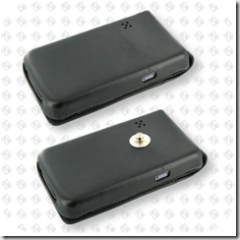 They do offer other cases and accessories as well, as you will notice when you visit the site. Line of Business (“LoB”) developers for mobile devices typically face challenges in understanding the trade-offs and best practices for developing robust applications for resource-constrained devices. In an attempt to address these issues, Resco has announced Resco Business Prototypes, a new product line focused around common Line of Business solutions. Bratislava, Slovakia — March 17, 2009 — Resco, a supplier of advanced developer components and tools for mobile devices, announces today new product line, which is optimized for Microsoft Visual Studio 2008 and the Microsoft .NET Compact Framework 3.5. The most important features of current situation in the mobile software market are basically the overall grow of mobility, its utilization in business solutions and lack of experience in development of mobile solutions. The most significant grow of demand in particular is in the field of business solutions with mobile upgrade. Mobility is very flexible tool that expands in a wide spectrum of business industries. Despite the fact that current mobile devices dispose of high performance hardware thus are able to run hardware demanding applications, the environment of mobile devices is much different from desktops. Desktop developers switching to mobile environment encounter many problems mostly due to the mobile limitations. Moreover, business solutions providers usually have neither the experience, nor the know-how of mobile environment. Based on these reasons Resco decides to present new product line of business prototype solutions. The goal of these solutions is to help developers cope with the difficulties of mobile environment. In the upcoming 6 months time perspective Resco will launch three business prototypes with source codes. The first prototype is focused on SFA solutions. It is especially assigned for sales people working in the field. Second prototype is targeted to retail — shopping sector and the third one to assets inventory management. The release of the first prototype is scheduled for April 2009. More details are sure to come, but I do like the idea of providing solutions with source code, allowing for organizations to “jump-start” application development with guidance from a proven developer of Windows Mobile applications and tools. Resco has a long history of developing highly successful applications for Windows Mobile devices, and their developer tools are equally successful. 2 weeks ago Jack Cook (ExperienceMobility.com), Steven Hughes(BostonPocketPC.com) and I went to visit Boston-Power. We had an amazing time there. They showed how the company was made and what their vision is for the future. We first met Christina Lampe-Onnerud and Boston-Power at CntrStg during the CES 2009 in Las Vegas. The news today is that they have their green, longer lasting batteries technology now available to consumers with HP notebooks. "Boston-Power’s longer lasting, Ecolabel-certified battery technology, Sonata, is available to consumer notebook PC customers starting today via HP. New HP batteries based on Sonata technology are available as accessories for 18 existing notebook models representing approximately 70 percent of HP’s consumer notebook PC portfolio. In addition to first-of-its-kind environmental certifications, Sonata Li-ion battery cells deliver sustainable performance for three years – three times longer than most other notebook computer batteries. In fact, HP is providing a three-year warranty on the batteries – the first and only notebook computer provider in the industry to offer such a warranty. Now available at http://www.hpshopping.com/, the new HP battery based on Sonata is available as an accessory priced at $149.99. Later this month, the HP battery will be available as a point-of-sale option for consumers buying new HP notebooks at www.hpshopping.com. The battery’s “drop-in” form factor enables it to be used with existing computers – including models in the HP Pavilion, HP HDX, Compaq Presario and HP G series. A complete list of compatible individual models is available HERE. More information can also be found on Boston-Power’s site at http://www.boston-power.com/enviro . Boston-Power is the first and only provider whose rechargeable Li-ion battery cells have earned the prestigious Nordic Ecolabel certification. The company has additionally earned a similar world’s-first certification for its battery cells from the Chinese Environmental Protection Agency. Sonata’s patent-pending, whole-system design makes it capable of benefiting a wide range of end-applications – from consumer electronics to transportation. As a result, total cost of ownership benefits inherent in notebook computer batteries prove increasingly impressive in cases where even greater power is required."